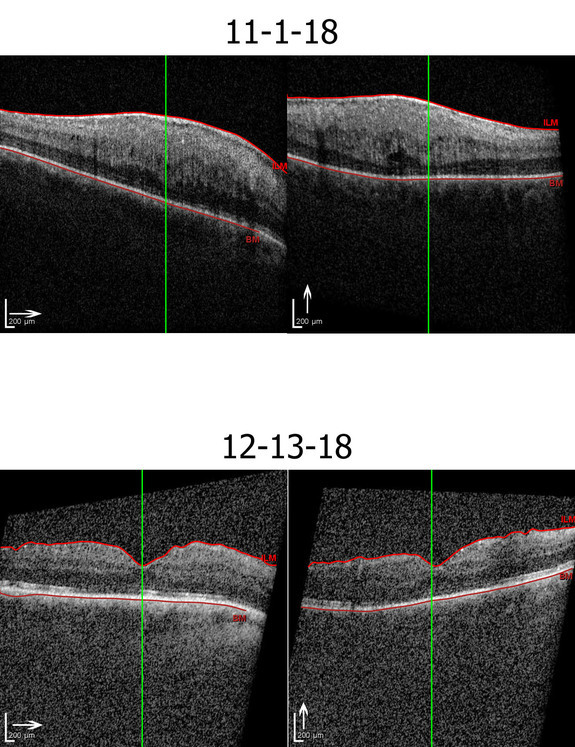 This montage includes preop and postop optical coherence tomography (OCT) images from the right eye a 70-year-old man who underwent vitrectomy surgery to repair a macular pucker, which developed following retinal detachment surgery done 9/10/2018. A macular pucker is scar tissue that forms on the vitreal surface of the macula. Although many require no intervention, they can be severe and produce metamorphopsia (a sensation that straight lines are wavy) and reduction of visual acuity necessitating vitreous surgery. The patient’s visual acuity decreased from 20/200 immediately following retinal detachment repair to 20/300 when the decision to repair the pucker was made. The top image was taken before the macular pucker repair.. The bottom image was taken a week following the macular pucker repair, when the visual acuity had improved to 20/60.